The lights were glowing down Main Street. The star projections went up in Toontown. Tomorrowland started filing with a force of excitement. The daily park-goers were being ushered out so that those who were here for Star Wars Nite at Disneyland could enjoy an exclusive experience. Space Mountain transformed back into Hyperspace Mountain, photo ops were set up around the park, a panel about Galaxy's Edge was held, special Star Wars themed fireworks illuminated the sky, and most exciting of all, a special parade would be held at midnight to start the May the 4th holiday off right. This wasn’t going to be just any Disney parade. As I parked in the cast parking lot and lugged my large bin over to check-in, the growing group of familiar faces in the circular red and black logos were all smiles. 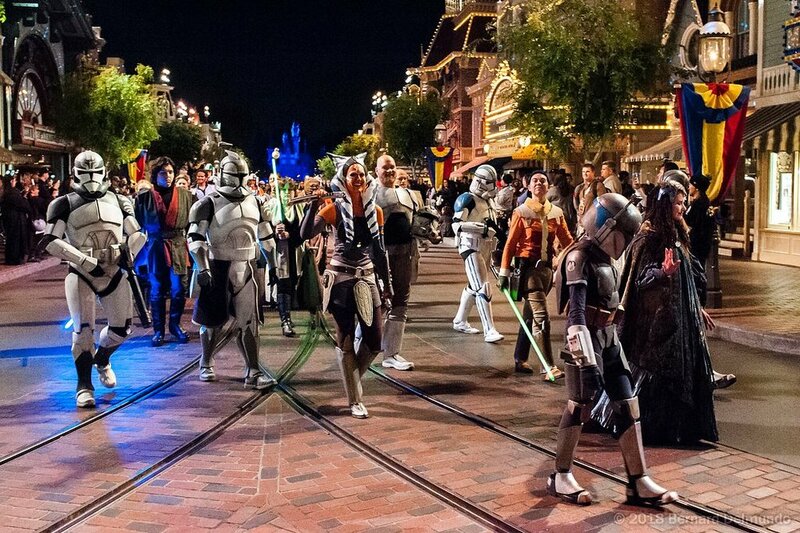 This was the first fan group parade to be held at Disneyland. There were many members of the 501st Legion, as well as the Rebel Legion, Mandalorian Mercs, Saber Guild, and even some people with unique costumes who were there to walk in the Parade. For most, it was a dream come true. Currently you can’t wear costumes as a adult in Disneyland, especially those that cover your face, so to be able to don your prized costume in the new home of Star Wars, was a great honor. The after hours event was a fun experience. As guests for the parade we got to explore the park, had little wait for rides as the park was reserved for event goers, could get a picture on Hoth, Endor, or even in the trash compactor. Disney’s own characters were still out in Launch Bay, and special May the 4th merchandise was available if you braved the frantic merch lovers ripping through the Emporium like a tornado. DJ Elliot played over the loud speakers much like at a Celebration convention and some special guests like Ray Park and Daniel Logan even showed up to admire some of the fan costumes. The special fireworks show was truly magical. Set to various Star Wars scores, it lit up the sky like a firefight and as Luke’s theme played, twin suns were shown on the Castle. You could hear the smiles in the crowd over the music. For us, it was a unique feeling. We knew that we were invited to show off not only our screen accurate costumes, but also our skills at owning the experience. Here we were at Disneyland where most of us frequent, the new home of our beloved universe from far far away, and being able to represent our life’s pastime in a grand parade. We were honored. As we were led backstage into our large changing room, the familiar clang of armor filled the room. We helped each other with strapping arms or thermal detonators on and stood ready for our march. You could hear the excitement in the cast members voices as they saw the magic of our lineup coming together. For them, this was new too. They were geeking out as much as we did our first time seeing a bunch of Stormtroopers suit up. We all related to each other over this love for Star Wars. We lined up in formation and walked over to the big gate. We stood perfectly still, ever ready to march our way through the park. The music changed and the doors swung open. 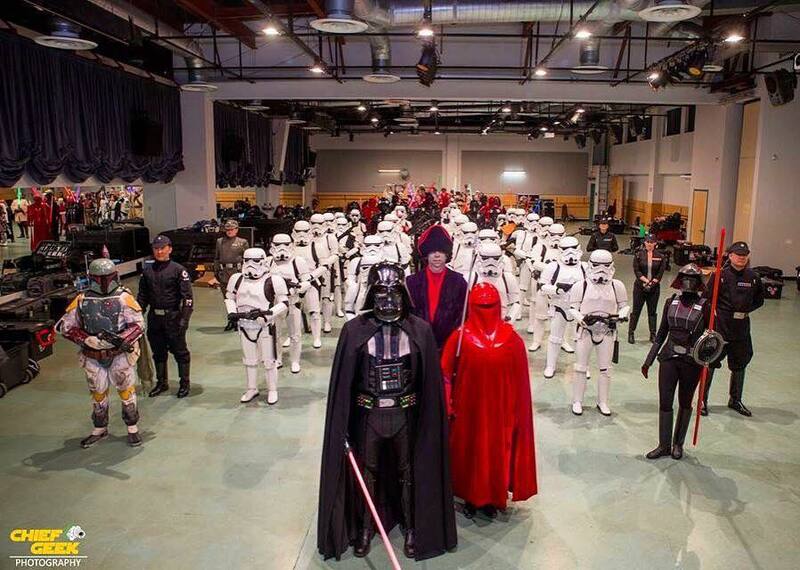 The cast members led with the banner, then Vader, then the sea of white armor. As we walked through the park, there were people gathered on either side in awe. Camera’s were flashing, smiles were growing, and the craziest thing of all was…they were silent. The overwhelming display of this universe brought to reality was breathtaking. They gasped and stared with glassy eyes as if they were in disbelief and didn’t want the dream to end. We walked through the park and were met by a bunch of Astromech droids at the end. Back through a large gate we were led into backstage until we all fit through. The buckets came off and we all looked at each other in accomplishment. The smiles that were under those helmets the whole time could now be seen. We had been a part of something truly special. We walked back to our changing area, packed up our things, and thanked the cast members for this amazing opportunity. As we hauled our gear back out of the park, I looked behind me with gratefulness. This was definitely a nite to remember.